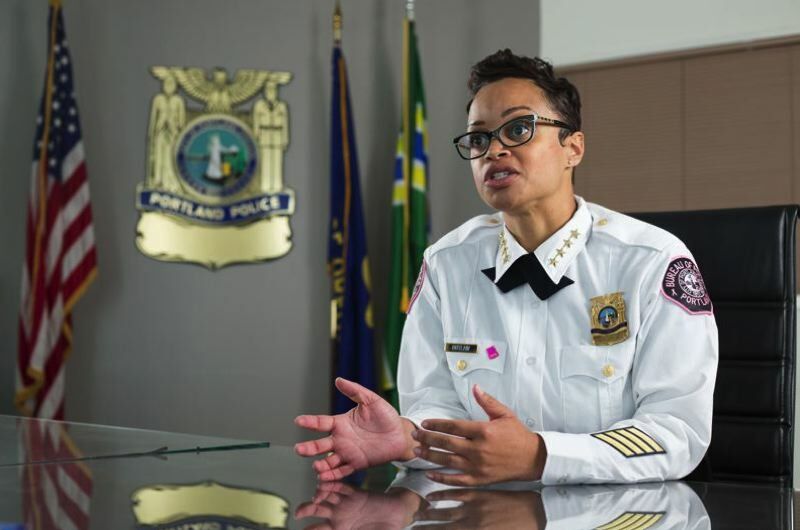 Portland Police Chief Danielle Outlaw gives interview on Antifa protest, other topics on Tuesday. Portland Police Chief Danielle Outlaw says it was her initiative to clear the protest camp that surrounded an Immigration and Customs Enforcement office in Portland. The Occupy ICE camp located off Southwest Macadam Avenue lasted just over five weeks before it was swept clean by local law enforcement in late July. "I went to the mayor and said, 'Look, this isn't sustainable, not just resource wise, it's just out of control for many reasons.' He was extremely supportive and said okay," she recalled in a radio interview. "I wasn't asking for permission to go out and clear this camp. I said, 'This is what's going to happen and here's how it's going to happen.' And again, I got the support to do that,"
Outlaw's comments — broadcast on The Lars Larson Show on Tuesday, Aug. 14 — mark her 10th month as Portland's top law enforcement official. She was hand-picked for the job by Mayor Ted Wheeler, who oversees the police bureau. She previously spent 19 years with the Oakland Police Department, rising up the ranks to deputy chief. Outlaw dodged several questions during the radio interview — declining to say if the black-clad anti-fascists known as Antifa qualify as a "terrorist" organization. But she did have some choice words about the media coverage of the Antifa and Patriot Prayer rally on Aug. 4, saying she was surprised that journalists later asked her so many questions about the riot control devices that were used exclusively on counter protesters. In her memory, one of the reporters at a press conference told her: "Yeah, I was there, we all heard the dispersal orders but nobody listens to that." "Why didn't you obey the dispersal order? There's been no focus on that, but there's been focus on our tactics. I tell people 'We hold ourselves accountable.' If we did something wrong, we own it. I own it." Outlaw also declined to reveal if she'll vote yes or no on an upcoming ballot measure that would repeal Oregon's "sanctuary" immigration laws. "I have to focus our attention on violent crime, quality-of-life crimes, not someone's mere presence," she explained. "Presence doesn't bother me." You can listen to the full 14-minute radio interview as a podcast here.